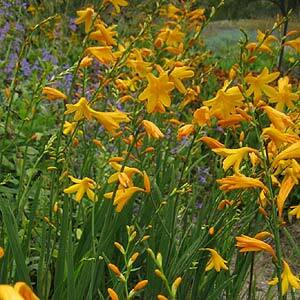 Crocosmia are a clump forming summer flowering bulb usually with yellow, red or orange flowers. Crocosmia lucifer, masoniorum and aurea are all popular cultivars or species. Related to Iris these are a very easy to grow bulb originally from South Africa. Tall and thriving in full sun to a little shade they do reproduce from corms and will spread in the garden. Over time clumps will become overcrowded and less floriferous, this is the time to divide them. Regarded by some as invasive you do need to take care to choose the cultivars that are less vigorous. The hybrid, Crocosmia x crocosmiiflora also known as Monbrieta, has been declared a weed in many areas. Cultivars such as Crocosmia ‘Lucifer’ with its scarlet red flowers are said to be non invasive. Best grown in full sun, however they will grow in part shade as well. Soil – Best in a humus rich soil, however they will grow in poor soils. Flowing period – Spring to summer and through to autumn. Flowers -Red on terminal spikes. Foliage – Tall sword like and pleated. Drought tolerant – Yes, although some water during summer is beneficial.